This page will now allow you to upload up to 15 images and 100mb total per upload! You can also use our new Online Orders - 30 form to upload up 30 images at a time. Please be sure to complete all REQUIRED(*) fields before submitting the form. Or simply login to have the fields filled in automatically. See Note1 below. Any omitted fields will be considered Lab's Choice. Your upload limit is 100mb total per upload. If you have more than 100mb total in the files your are uploading, you will be able to submit the form repeatedly to stay within the 100mb limit for each submission. A Tutorial Section is provided at the bottom of this page to help you complete this process with ease. If you have not gone through this Tutorial before, please take 3 minutes to do so now. Click here to view the tutorial before you begin. If you have larger batches of files to upload, please click here to contact us for instructions on using our FTP site. Please see the section below on "Submitting Print Instructions" before completing these fields. When you click "Submit"; Wait for the Confirmation Screen to appear before you close the browser or navigate to another page. This is the only way to be sure that your order has uploaded successfully. You will receive an email confirmation of your order upload. If you do not; please be sure your email system is not blocking the email as spam. These emails come from photo@douglasphoto.com. You may need to check with your email provider to be certain this address is not blocked. You may also need to check your firewall and virus protection software to make sure that emails from douglasphoto.com will get through. If you do not receive the Confirmation Email, please call 316-264-3013 to check on your order. Note1: If you become a registered user and login when using this form; most of the fields will be completed automatically using information from your user profile. So use the "Register" link at the top of the page to create a user profile and this form will be much faster to use. Please be sure to complete all the fields in the user profile to assure completion of the online order form. Use the "Screen Name" field of the user profile for the name you want to appear on your orders. Each file MUST have a file extension (i.e. .jpg, .tif, etc.) to upload successfully. If an image is being uploaded for artwork only, you may skip the Printing Instructions section of the form. If you have several different print sizes for the same file, you may use the comment field to list the sizes, or you may submit a text file with instructions (see the section "Submitting Print Instructions" below). Because of improvements made on this form, it is now possible for you to submit a ".txt" file with your printing instructions instead of using the form fields above. 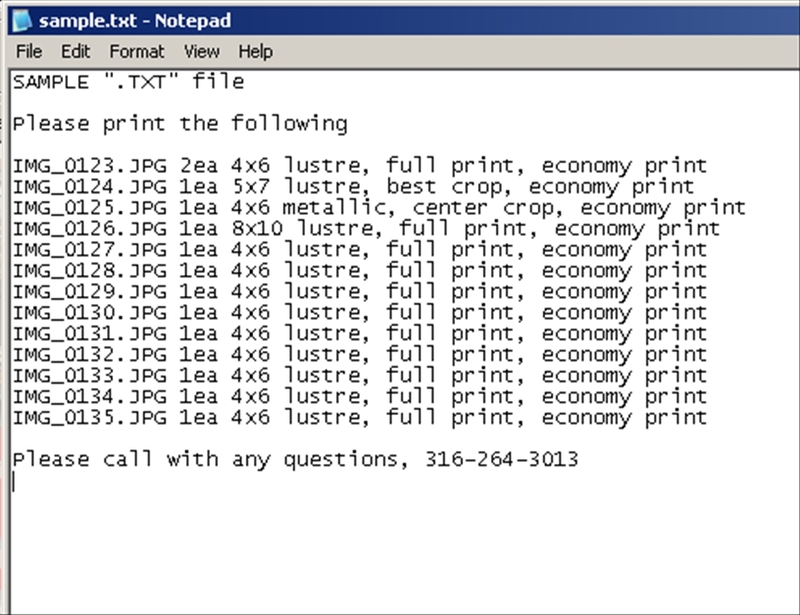 To do so, you can use any text editor (like Microsoft's Notepad) to create the instructions for printing your order. Please feel free to use this txt file in place of the comments field. While viewing the Tutorial below, you can scroll up to the form and fill out fields, then scroll back to the tutorial and continue viewing where you left off.